Well, after 5 days of fermentation, the must was down to 3 Brix as measured this evening by my low-tech specific gravity float. 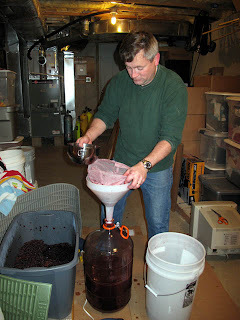 Since I want to press before fermentation is totally complete (Peter Brehm recommended that I press at between 5 and 2 Brix) it was time to press. 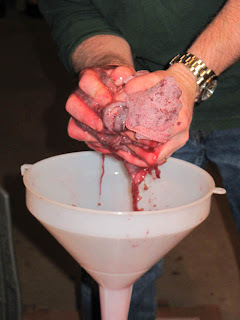 My big concern was that I wouldn't have enough juice to fill a 6 gallon carboy, but that turned out to be unfounded. It was clear by the time the carboy was half full that I would have plenty. Since I don't have an actual fruit press yet, I did it the low-tech way. I put a funnel in the carboy and then used a mesh bag as a filter. I literally wrung out the bag to get the juice out of the grapes. The nice thing about this is that I didn't wring it too hard so I hopefully don't have the possibility of pressing too aggressively and getting too much tannin out of the skins. 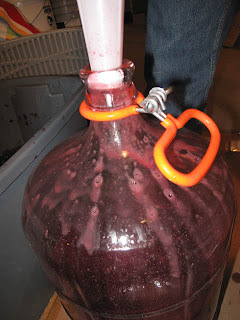 It only took about half an hour, and I ended up with a full carboy, plus three wine bottles. I wish I had a gallon jug for the overage, but I don't. Next time. Once I do the first racking, it will all be consolidated. Now I need to wait for fermentation to be complete so I can initiate malolactic fermentation. I wrapped the electric blanket around the carboy and the three bottles to keep the temp up around 75-85 for the next day or so. I'll keep monitoring the specific gravity and report back.